An important part of the recruiting process should be building a pipeline or prospect pipeline, also known as a talent network or talent pool. Take every opportunity to expand your database. These can be contacts from your sourcing activities or, for example, from events. Events in particular can be a lucrative source for suitable candidates. You should collect and develop all data in your candidate relationship management (CRM) tool. It is important to stay in contact with candidates. Don't forget the contacts you collected after a trade show and make sure to send emails to keep in contact with the candidates. This is the only way to stay in the picture as an attractive employer. It could be that you want to use these leads again in 6-8 months, for example, as suitable candidates for an open position. Today you have the opportunity, via marketing automation, to maintain contact with these candidates in a standardized way. For example, you could set up automatic emails, such as a newsletter. This is how you can maintain complete communication with your candidate database and the only cost is time. The topic of leads also concerns your career page. You should give those who can't find the right job on your site the opportunity to stay in touch with you. We recommend to include a talent network sign-up form here. As a rule, only 10% of candidates from your career page click on your job listings. This means you lose 90% of your traffic here if you do not take further measures, such as a talent network. You should always try to keep as much of your own flow of visitors as possible. 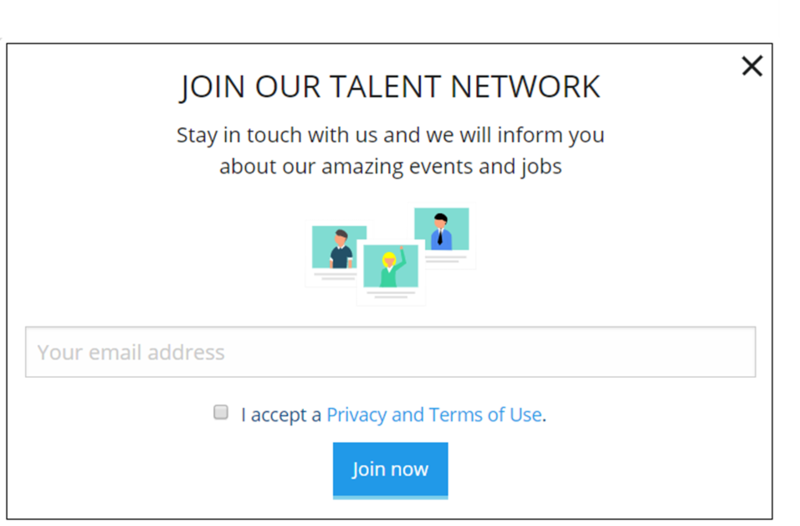 You should integrate the talent network sign-up form in several places. Right on the careers page, for example as a pop-up, and on your job listings. Also remember to integrate this for mobile devices. The same applies to contacts at an event or trade fair. Again, you should allow your prospects to stay in touch with you. Always remember that these contacts can become interested candidates. Are these topics still too abstract for you? Would you like to see more specific examples from your industry? We would like to show you best practice examples and concrete implementation in the Talention software. Just ask for a free demo here and someone will get in touch with you shortly. Request a demo here.